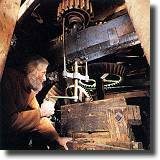 Enjoy the sights and sounds of an early 19th-century working mill - the splash of the water-wheel, the sound and smell of grinding grain. There are a number of fascinating machines - fanners, elevators, sieves and a sack hoist - all still in use. Displays reveal the important place the Mill once held in the community, not least as a place for local gossip! A delightful walk follows the mill lade through an apple orchard with its picnic tables and past the millpond. All year, daily until dusk. Thursday to Monday 12.00pm - 5.00pm.Sunday 1.00pm - 5.00pm. Groups of 20 or more please book in advance. Family (2 adults + up to 4 children) £29.50; Family (1 adult + up to 4 children) £23.00. North of Barry village, between A92 and A930, 2 miles west of Carnoustie, Angus.